The 7th Annual Fairfield County Open gets underway! Participating in this year’s edition of CT’s strongest and most prestigious annual speed tournament gave me a somewhat lopsided view of the event, as I was mostly focused on myself and my nearest competitors. 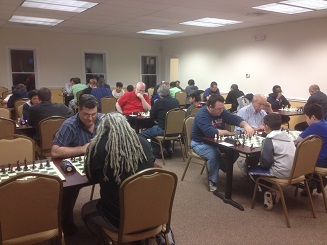 Topping the field were no less than 3 grandmasters, including multiple US Champion Joel Benjamin. Despite his finishing with a stunning 8/9, nothing could be more of a testament to the strength of the competition than the fact that not a single grandmaster, Benjamin included, could lay claim to sole first. 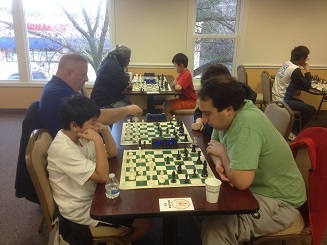 While Benjamin tied with the indefatigable legend IM Jay Bonin for top honors, the other two grandmasters – Michael Rohde and Mikheil Kekelidze – finished out of the prize pool completely, while, far from the tangent this self-effacing friend and mentor of mine of days past sometimes portrays himself as, FM Dan Shapiro traveled through a time machine (along with staff member NM David Quinn) to lay sole claim to third place. 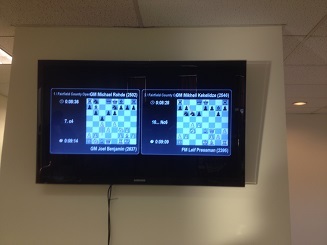 In fact, I found myself having to pause outside the master’s room (which housed the top 4 boards) at the start of one of the rounds, as I overheard Joel Benjamin remarking to the room’s occupants that, looking around at his competition, he felt like it was 1981 all over again. Indeed, as I entered the room I found myself realizing that at nearly 30 years of age, I was probably its youngest occupant and, in the spirit of age before beauty I was dutifully booted from the room when Joel handed me a signature drubbing. 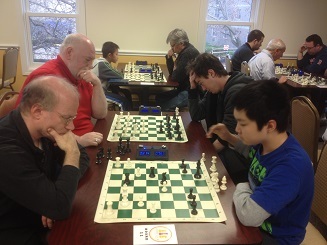 2012 CT Champion NM Gary Shure (L) takes on Andrew Bykovsky. The next time I found myself in the Big Boys room I was up against GM killer FM Leif Pressman. Other than Joel, none of the GMs made it past Leif unscathed and I was lucky to do so after emerging two pawns down out of the opening and behind on the clock. In round 7, I faced the eponymous Al Lasser, who won this year’s “Al Lasser prize”, a loyalty prize awarded for Al’s constant attendance from back before the days of the club’s opening. 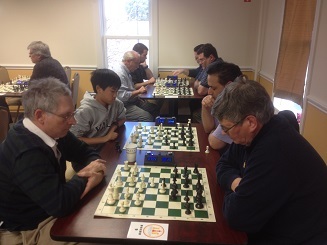 Also receiving special prizes were Greg Beaumont, for heading the largest carpool of participants, Michael Rohde, for being the first grandmaster registered, Oliver Chernin, for being the overall first player registered, and Yoon-Young Kim, for being the first class player registered. A big Congratulations to all of them! Speaking of Yoon-Young, keep your eyes on this scholastic talent, who also tied for the U2000 prize. Though he may not be a class player much longer, he is and I expect will continue to be a player with tremendous class. I should know, as he displayed remarkable maturity and graciousness after a difficult defeat at my hands a few weeks back. It was the kind of loss that many would find dispiriting and discouraging, as Yoon had me on the ropes for most of the game, but Yoon’s positive approach is the kind from which winners are made. CCFC Instructor NM David Quinn (L) exits tournament retirement! Also more than deserving of mention were our numerous class prize winners. Under 1600 was won outright by our own Andrew Rogozinski, another scholastic talent. Lawrence Moy took U1800 for the 2nd straight year (!) and U2000 was split between Joe Bihlmeyer, Andrew Bykhovsky, and the aforementioned Yoon-Young Kim. Expert Zachary Tanenbaum was the sole finisher with 5.5 and won the top U2200. Finally top U2400 was shared between Joshua Colas, Leif Pressman, Furqan Tanwir, and yours truly. Congratulations to all the class prize winners! The later rounds continue after the sun goes down. Finally, we would like to thank all the participants and especially let those for whom it was their first time at the club know that we enjoyed having you and hope you come back soon, be it for a weekly quad, lecture, or other event. As always, it was tremendous fun and produced a lot of entertaining and fighting chess games, some of which I’ve analyzed for your enjoyment here. The top games were displayed on the large monitor. 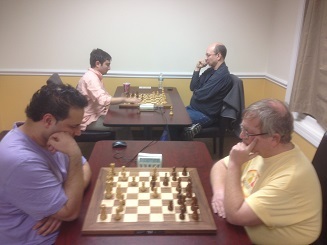 FM Leif Pressman (rear left) vs. GM Joel Benjamin and NM Furqan Tanwir (L) vs. IM Jay Bonin.